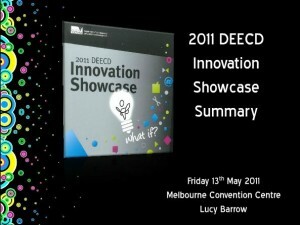 Friday 13th: Definitely My Lucky Day at the 2011 DEECD Innovation Showcase! 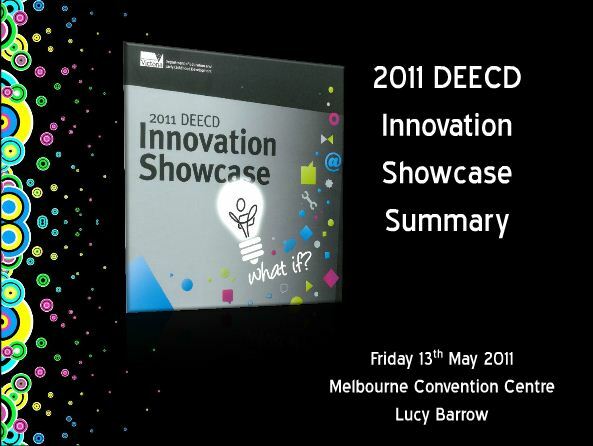 The DEECD Innovation Showcase is an annual event showcasing the wonderful work of students and educators in Victorian Government Schools. I was so excited to have the opportunity to attend this year’s Showcase with our Director of ICT, Nathan Burgess. The link to the SlideShare presentation below shows the many highlights of the day for me and I was fortunate enough to share these highlights afterwards with members of our ICT Professional Learning Teams Program. At our school, we are very fortunate to have wonderful support to attend and participate in various PD Programs. I believe it is important that we then share our highlights, what we learnt, etc… not only with our colleagues, but with the wider education community. The day was full of inspirational people! Some of the inspiration came from unlikely sources like comedian, Anh Doh. We laughed and we cried as Anh told the most amazing stories of his life, many of which struck a chord with me as an educator. Congratulations to all involved in this year’s exciting Showcase. Thank you for giving educators from Government, Catholic and Independent Schools the opportunity to see your inspiring work. I have a new role at my school this year as Head of eLearning & Library Resources. Part of our vision for the Library is for it to become the “digital hub” of the school. It is a place where staff can participate in ICT Professional Learning and experiment with technology. I was fortunate enough to attend the 2010 VITTA Conference. One of the many highlights for me was the Microsoft Kinect Lounge where I had the opportunity to try the Kinect system for myself. I was taken by the amazing graphics, engaging games and the ease of which I could control the activities through simple gestures. I was keen to trial the use of the Kinect system at school to see where it could take us. The 2010 Horizon Report for Australia and New Zealand predicts that we will see a widespread adoption of Augmented Reality within the next two to three years and, within the next four to five years, the widespread use of gesture-based computing. Yes, some people are sceptical about the relevance of this type of technology in education but with sites such as KinectEDucation emerging and Stephen Howell‘s work with Kinect and Scratch, there is no denying that there are exciting possibilities! On Friday, we hosted two groups of staff in our Library where they had the opportunity to use Kinect Adventures. The first session was only 20 minutes long due to a school event and was made up of teachers currently participating in our ICT Professional Learning Teams Program. The second session was an afternoon tea for members of our ICT Department. Our second session was a “Kinect Afternoon Tea” and designed to offer our ICT Department staff some “time out”. We are very fortunate to have fabulous technical and “behind the scenes” staff. What struck me about this session was the team spirit and healthy competition that quickly emerged. They were encouraging each other and keen to see who was going to get the top score. This was a use for the Kinect system that I had overlooked – staff team building. Up to that point, I had focussed only uses only for students. We decided that we would have to buy a trophy and acknowledge the “Kinect Champion”!